People say money can’t buy love, but if you’re in love with money then you’re all settled, right? 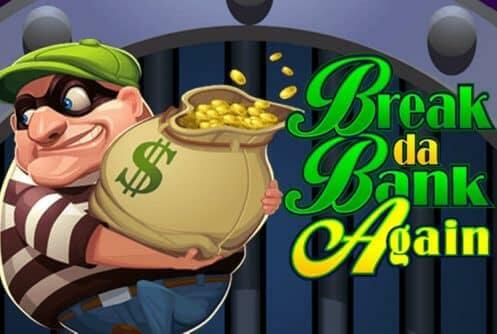 For all you money lovers out there, Microgaming developed a nice, revised version of their Break da Bank slot machine called Break da Bank Again. It’s better, shinier, richer! The layout is improved and the music score is relaxing as if the slot is about a vacation and not the Almighty Dollar. In a way, Break da Bank Again slot machine is a simple slot, but surely one that can make your blood boil and your ambitions run wild. It comes complete with a feisty game mechanism and prizes worth your weight in gold. Microgaming designed Break da Bank Again slot with a classic notion of what a bank vault might look like and what it might contain. The five reels are big and wide, showcasing valuable symbols offering their respective payouts for winning combinations across 9 lines. The number of active lines can be manually adjusted, but the frequency of achieving winning combinations by aligning matching symbols is left to chance. Think of it as trying to crack a code to a safe, the right symbols need to land to the right places. And what majestic symbols they are! Playing card icons aside, Break da Bank Again includes appealing symbols such as gold coins, money stacks, checks, gold bars and the tanzanite jewel. The massive jewel pays out 1,500 coins for five-of-a-kind in the base game. Special symbols are also in play, a Wild represented by the Break da Bank Again logo and the Scatter depicted by the vault door. The Wild replaces other symbols, minus the Scatter, to create winning combos and multiplies the win 5 times. That’s instant treasure right there! The ambitious slot has one main feature, and that is the Free Spins round. To trigger the bonus round you’ll need to land 3, 4 or 5 of the vault door Scatter symbols anywhere on the reels. The round will thus contain 15, 20 or 25 free spins and all the winnings achieved during complementary spins will be subjected to a 5x multiplier. It’s not possible to re-trigger the entire bonus round but if you land a Scatter another free run will be added to the total number of freebies. The Wild symbol has an important influence on the payouts during Free Spins Bonus. If the Wild forms a part of a winning combination generated on a free spin, your line bet won’t be multiplied 5 times, but 25 times. It would be a shame if Break Da Bank Again slot machine didn’t have a Gamble feature. Microgaming delivers once again and players have the chance to double their winnings in a traditional ‘red or black card’ prediction mini-game. Daring bettors may want to predict the suit as well and quadruple their wins. On the whole, Break Da Bank Again slot is appropriate for players of various budget sizes, offering a nice betting range, a motivating theme, high volatility and considerable payouts.